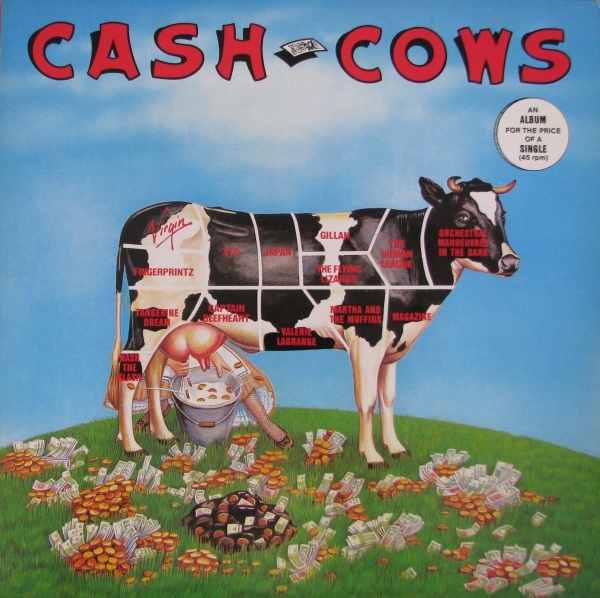 Yesterday, we looked at Virgin’s 1980 “Cash Cows” compilation, but there were several variations. As I mentioned yesterday, The Professionals filed a lawsuit against Virgin to have the track replaced, so a second copy was made. From data I’ve found on the Kevin Coyne website, it seemed that “Kick Down The Doors” was replaced by the Magazine track “Permafrost.” I have not been able to find a catalog number, but I’m guessing MILK1 was not used for the second pressing. The first version of “Cash Cows” was also released in The Netherlands [cat. no. 202.969] but apart from the catalog number, it was identical to the first UK copy. Of greater interest was the fact that Virgin also released the album customized for one of their Commonwealth markets. I’ve not heard previously of Valerie Lagrange, but she’s a French [not French Canadian] singer whose 1980 Virgin album was released in France and The Netherlands, as well as Canada. Virgin house producer Mike Howlett manned the boards and with The Sinceros as her backing band. I’ll admit here that I have never heard this singer because the one time I found a copy of this album [while crate digging at a surf shop/record store in Uclulet, British Columbia, I ceded the copy to my friend Charles, who collects variants of this album. The next shakeup in the running order is the presence of Nash the Slash with his song “Swing Shift,” from his “Children of the Night” album. I first heard Nash as the insanely talented violin player in the Toronto late-blooming prog band FM. He played on their [frankly awesome] “Black Noise” album before going solo for a career that was more Bill Nelson than Rush. His mandolin work [with echoplex] sounds every bit like sequenced synths! He self-released that album on his own Cut-Throat Records label as produced by Steve Hillage, and Virgin subsidiary Dindisc Canada picked up the option for wider release. Nash is a very talented guy who is all over synthesizers and drum machines in addition to his primary instruments; violin and mandolin. Nash played violin on Gary Numan’s masterpiece, “Dance” as well as being tapped by Numan as an opening act. The quintessential Canadian New Wave act Martha + The Muffins [also on the Dindisc label] weigh in with a single from their second album, “Trance + Dance.” M+M managed the neat trick of scoring a top ten UK single with “Echo Beach” from their debut album. Not many other Canadians can make that claim. This song shows the band transitioning away from the New Wave pop of “Metro Music” to the denser, Talking Heads style they would pursue for the rest of the eighties. Fingerprintz, Captain Beefheart and Gillian all appear, but with different tracks chosen for the Canadian market. The final two tracks differ more greatly. Orchestral Manoeuvres In The Dark are represented by an awesome album track from their second LP “Organisation.” This song has long been a favorite of mine due to its dramatic, thunderous percussion. It’s nice to see it getting some special attention here on this album. Finally, while the UK edition sported Mike Oldfield, the Canadian “Cash Cows” also had some old-school prog artist making a showing for the roots of Virgin Records. Tangerine Dream’s 1980 album “Tangram” has a brief excerpt for this album of the album length composition. Considering the relative small size of the Canadian market [it’s 1980 population was 24.5 million] it’s remarkable that Virgin Canada was the only other territory outside of the UK [and The Netherlands] to get this compilation released. That it’s re-compiled especially for the Canadian market is even more surprising. The Dutch edition is a straight run of the UK version. Virgin trainspotters have a lot to be thankful for then. It’s certainly true that by 1980, Virgin records was sitting on top of the world. Simon Draper [Virgin founder Richard Branson’s cousin] was in charge of the label and he was on a tear. Nearly ever one of my favorite bands at the time were signed to Virgin Records or one of its subsidiaries. This record, then, is a souvenir of that heady time in any of its incarnations. This entry was posted in New Wave Compilations and tagged Cash Cows, Martha & The Muffins, Nash the Slash, OMD, Virgin Records. Bookmark the permalink. There is a distinct possibility that “Cash Cows” was re-done for either Australia and / or New Zealand, too. Virgin Canada also seemed to always march to their own drummer. Many re-designed LP covers etc. And there are many more nice Virgin compilation LP’s, “New Wave 1980” for Virgin Netherlands etc. I do hope you continue your examination of new wave compilations! ronkanefiles – As I stated, “Cash Cows” is not quite a New Wave compilation. It’s very much a portrait of Virgin Records in transition. Had they done a similar volume in 1983, it would have been another pivotal point for the company as it began stumbling into irrelevance with the Culture Clubs and Paula Abduls of the world.